Here at Feel Good Foodies we’re pretty into super foods, which are apparently becoming rather trendy in the outside world as well. You may have noticed the super food reference in recent Subway commercials promoting their “yummy” avocado. Super foods are also they key players in SELF magazine editor Lucy Danziger’s new book The Drop 10 Diet – which I’m currently reading. At my old job, Friday’s meant “Bagel Friday,” my carb-loving favorite day of the week. Did I break this tradition when recently switching jobs? Absolutely not. In fact, I pass one of my favorite bagel shops on my walk to work, so my bagel consumption has admittedly increased. I’ve been desperately trying to cut down my carb consumption after gaining five of my lost ten pounds back, so this week Bagel Friday is out. Today I put on my tunnel vision as I passed the bagel shop, and instead wandered into PRET A MANGER in hopes of a healthy replacement for my bagel ritual. Cue the Protein Pot: hard-boiled egg, red quinoa, spinach, avocado and tomato, packing an a.m. protein punch with only 230 calories. The eggs, avocado and quinoa make this snack a super food party! Health benefits listed below. With a little salt and a lot of pepper (because I’m a pepper-loving freak), this was the perfect breakfast to start my Friday. The gentleman who rung me up (a helpful, friendly man by the name of Jack) said that he saves the Protein Pot for after the gym, another great idea. It’s also an easy grab-and-go meal that you can make at home. You could package a few days-worth of all of the ingredients minus the avocado, and then add the avocado when you’re ready to eat it. Jack also told me that my delicious breakfast is actually a “test” product. What does this mean? 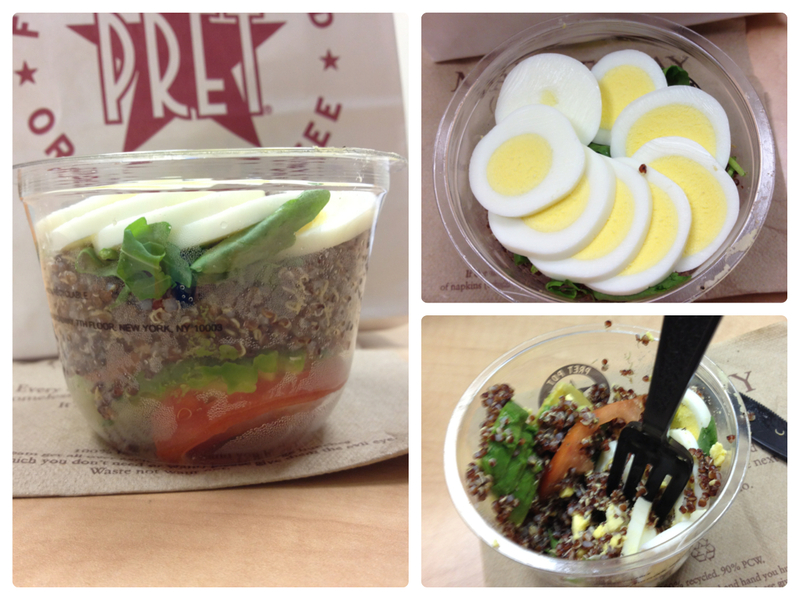 The Protein Pot is only available in three PRET locations right now: 42nd St. & 3rd Ave., Astor Place and 23rd St. & 5th Ave. They will test it for three or four weeks, taking customer feedback into account before deciding whether or not to make it available at all locations. Obviously I will continue to purchase it obsessively, in hopes of it becoming one of my meal-plan staples. Have you tried the Protein Pot? If yes, what did you think? Avocados are a good source of fiber, potassium, and vitamins C, K, folate, and B6. Half an avocado has 160 calories, 15 grams of heart-healthy unsaturated fat, and only 2 grams saturated fat. One avocado contains more than one-third daily value of vitamin C, and more than half the day’s requirements of vitamin K.
Eggs are an incredible source of protein (7 grams per egg!) – they also have only 75 calories, 5 grams of (good) fat, and 1.6 grams of saturated fat, along with iron, vitamins and minerals. Quinoa is a protein powerhouse Protein Powerhouse, packing a higher protein content than wheat, barley or other major grains. One cup of quinoa has 9 grams, which trumps the protein-rich egg. Quinoa, which contains all 8 of the essential amino acids, is a complete protein. Quinoa is a satisfying, low-cholesterol source of complex carbohydrates. Rich in fiber, it’s digested slowly and has a low glycemic index, helping you steer clear of the blood-sugar roller coaster. With its chewy texture, quinoa can be eaten at a leisurely pace. Its heart-healthy polyunsaturated fats will leave you feeling full while providing more nutritional content than breads or cereals made of refined grains. Quinoa is also a flavorful source of plant-derived calcium. Calcium builds and maintains bones and teeth, helps regulate the contraction of the heart, and facilitates nerve and muscle function. One cup of cooked quinoa contains 30 milligrams of calcium. Quinoa also contains impressive quantities of potassium, magnesium and zinc, minerals that are crucial for heart, nerve and muscle function. Heya i'm for the primary time here. I found this board and I to find It truly useful & it helped me out a lot. I am hoping to present one thing back and aid others like you aided me. Hello there, You've done a great job. I will certainly digg it and individually suggest to my friends. I am sure they will be benefited from this web site. routinely, your muscles will grow to meet that need and no more. picked up anything new from right here. I did however expertise some technical points using this web site, since I experienced to reload the web site a lot of times previous to I could get it to load properly. 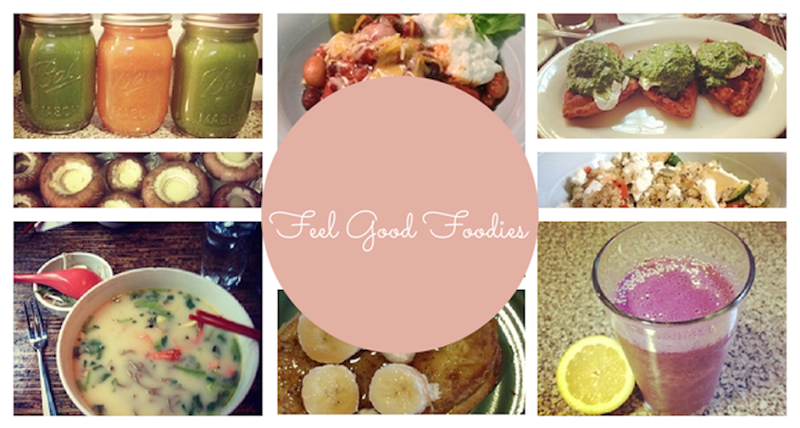 Welcome to Feel Good Foodies, a blog about food, and daily activities surrounding food, that make us feel good. While we strive to be health-centric, this 'feel good' notion may not always mean ‘healthy,’ but we believe that all good things are accomplished with balance. We can have our salad and our cupcakes too.